At the annual Games Developer Conference 2019 that took place on Thursday, Valve’s developer and UI designer Alden Kroll state that this year will be a monumental one for Steam as in the impending few months, added features such as the new Steam Event will find its way into the platform as well as the gaming library will be redesigned with a more clean and convenient layout for enhanced user experience. The new look will feature an improved gaming library that will hold extra information and will make prominent all those games that have been recently played as well as games that have been recently updated. 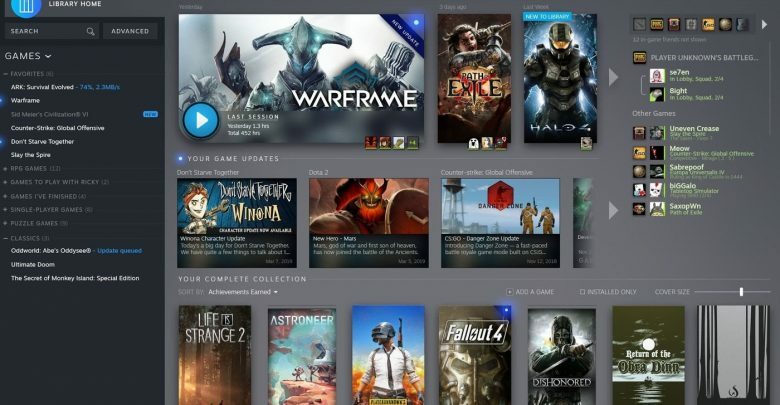 In his address at the GDC, Kroll showed some visual examples of the new design as every Steam library will now feature a homepage of its own. Information about each game will now be heavier and at a glance users will be able to know the essential details of the game that will make the experience of navigating between different features of the homepage much more easy for them. For instance, the top most section of the new Steam homepage design will feature large tiles that display titles of games that users have played most recently. Additional information will include the time during which last session took place, the amount of time a user has spent time playing the game in that session, as well as the total number of hours the user has spent on the game in its entirety. The whole purpose of keeping recently played games at the top is that it will enable users to directly jump into the games they’ve played the most. Apart from that, there are some other key elements that will be incorporated in the homepage. For instance, the right hand side of the column will now show an activity feed of your friends list as well as their most recent activity. It will also highlight if your friends are active in game at a particular moment and you’ll immediately know what they’re playing and be able to join them too. Beneath the activity feed is a section for DLC, your in-game achievements, trading cards, and the screenshots you have taken. Vertical thumbnails of other games in your collections will be implemented that can be scaled to a bigger size. An assortment of new filters will help sort, categorize, and display your games on the reworked Steam homepage. Perhaps one of the most exciting new additions to the library is the extensive tag system. Before the conference, the tags were available on the Steam store but now will make their way to the library’s homepage as well. Now, if you’re looking for a game in your library that you can’t really find, you can search for it using several tags in the advanced search system in order to help Steam sift through your entire gaming collection and find it for you. To further fuel the excitement, we will also be seeing an introduction of the new Steam Event feature which Kroll said is meant to make the relationship between the developers and users much more interactive. Whenever there’s something interesting happening in a game, developers will easily be able to notify gamers of features they can unlock and other in-game events and rewards they can accumulate. Some such examples of the Steam Event feature are being able to see livestreams by the developers, having in-game events that tie to public holidays, as well as other bonus weekends where you can get the chance to partake in tournaments or even win double XP. All events on Steam will be accessible including current events that players would be able to join and future events that they could receive reminders for. Players will also be able to subscribe to reminders for upcoming events with the assistance of external calendars such as Google Calendar, iCal, email, text messages, mobile notifications, and of course through the Steam homepage itself. This new redesign by Valve for the Steam library is expected to be released sometime this summer in its beta form. Although it is not exactly known when the official version of the new design will roll out for player use but what has been suggested and shown by Alden Kroll in the conference so far should give Steam users something to look forward to and feel greatly excited about.